My wife and I recently had a game night with our friends, who also have young children, and we decided to bring a family favorite as our choice - King of Tokyo. This was not a family game night, however, it was an adult game night. The kids played downstairs while the adults played King of Tokyo upstairs. I'm sure you realize that not every board game we play with our five-year-old has the power to be described this way. 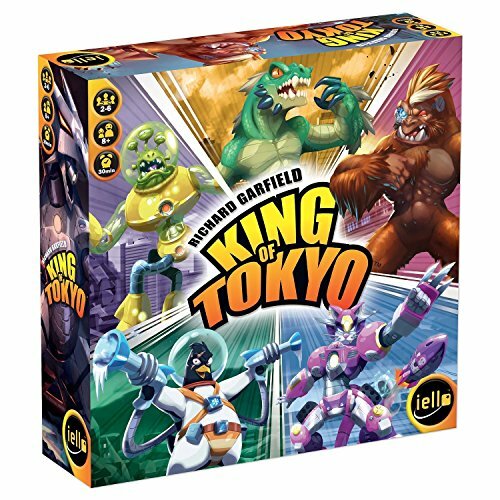 King of Tokyo was made by Richard Garfield and published by Iello, and their recommended age says 8+. But our son began playing with us when he was four. The reason this might be possible is because there isn't necessarily any reading required (you can just tell your kids what the cards available to buy say) and the choices to be made are not difficult to make or to explain to others. It's also very easy to help youngsters keep track of their life and their stars on their game card. However, games do last about twenty to thirty minutes, so the ability to focus for that long is basically the biggest requirement. Another good option is to team up with someone and play one monster together, which is what we often do with our littlest. "...not every board game we play with our five-year-old has the power to be described this way." Luckily, the design and the imaginative characters and cards make King of Tokyo something easy for our little guy to focus on. The characters themselves are certainly my son's favorite part, and I find it hard to disagree. I personally prefer to play as Cyber Bunny, a rabbit in a giant robot suit, and my son likes Gigazaur, a very Godzilla-esque creature. Occasionally he is more interested in pretending to be Gigazaur than rolling the dice. Just a moment ago I said, "hey what do you like best about King of Tokyo?" and he very matter-of-factly said, "Gigazaur." 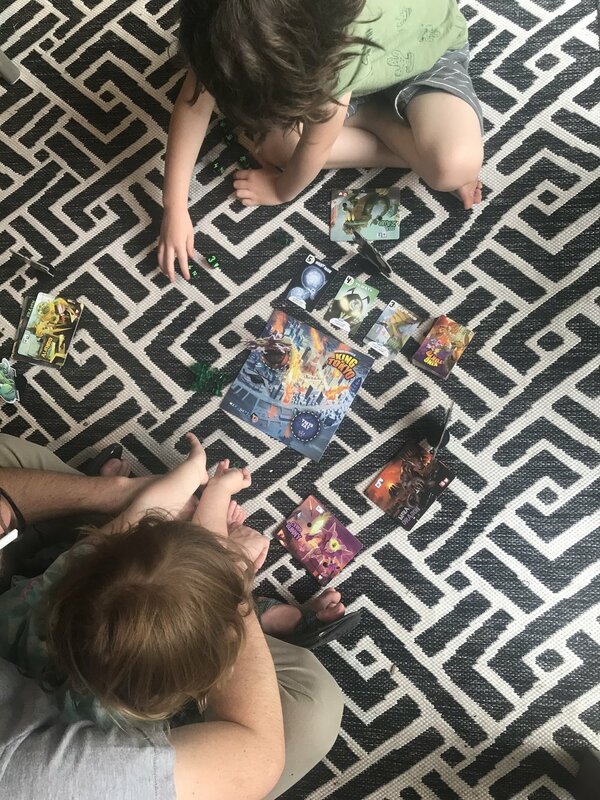 "Luckily, the design and the imaginative characters and cards make King of Tokyo something easy for our little guy to focus on." Gameplay consists of rolling the dice up to 3 times, similar to Yahtzee, and trying to get things like attacks, energy cubes to buy cards, and hearts to heal yourself. If you happen to be inside Tokyo, your attacks attack everybody else at the same time (powerful! ), but you can't heal yourself and everyone else attacks only you (risky!). Because of this you have to choose wisely when to give control of Tokyo to someone else and go lick your wounds. Special cards that you can purchase change your power in all sorts of different ways, and are the real secret to making the game different every time you play and changing up the strategy required. It's actually quite fun just to flip through all of the cards to see the art and imagine what you could do with the powers. "Occasionally he is more interested in pretending to be Gigazaur than rolling the dice." 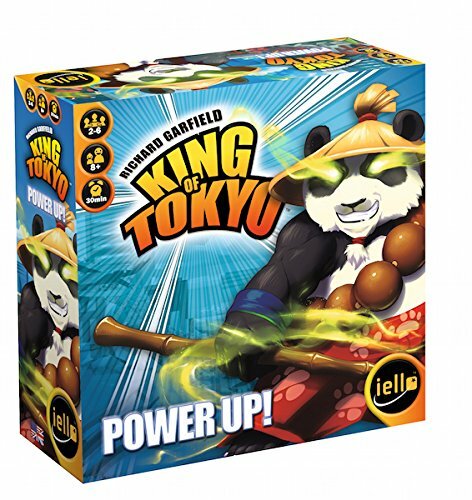 King of Tokyo is one of those board games with a solid mixture of luck and strategy and multiple paths to victory available for you to choose from. There are also some optional expansions available that add new monsters and even more powers to the game. 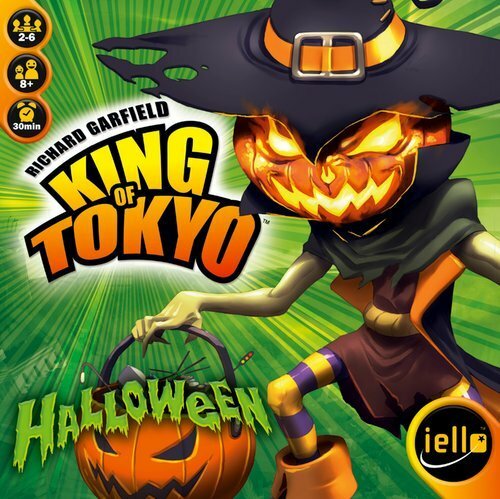 (The halloween and power-up expansions require the base game). I'm happy that the kids get to use their imaginations - and bonus points awarded for working on things like strategy and basic addition and subtraction. I'll always think of it fondly because it was the first big strategy game we played together with our son where it really clicked and I suddenly realized, "hey, we're really playing here!" Have you tried this game before? What's the first game where your kids began to stand on their own two feet? Let us know in the comments below.